I have the feeling that my father was more the scrapbooker than my mother. From his childhood, he had albums with photos mounted using photo corners onto black paper and funny captions written in white. My mother simply kept memorabilia stashed in a drawer or box — a mish-mash of notes, photos, and newspaper clippings. I follow my mother’s ways. No matter who actually compiled it, we have a huge scrapbook that follows my mother and father’s relationship from first dates to wedding to first child to internship appointment in Cooperstown. My father pulls it out from time to time and leafs through it. The scrapbook has fallen apart and been put back together so many times, though, that it’s no longer in the right order. Sure enough, he took her to several boxing matches. I’ve never understood the sport of boxing. It’s so barbaric — putting two guys in a ring and having them punch each other until one is unconscious. 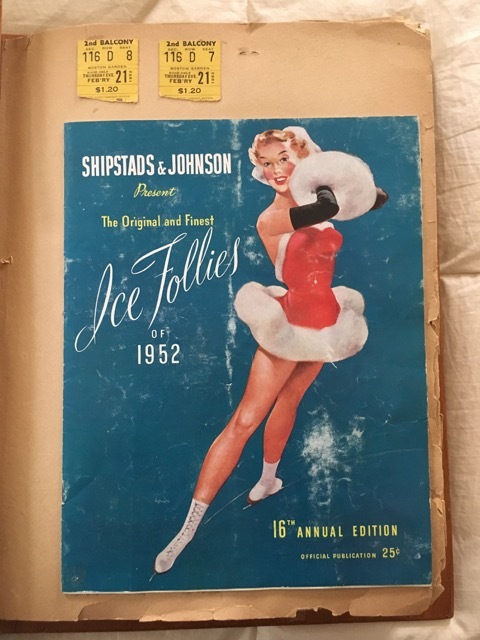 He also took her to the Ice Follies. I think he redeemed himself with that one. A hockey game — the Bruins v. Red Wings. This was on his birthday, so maybe my mother got those tickets as a birthday present for him. And a baseball game — the Red Sox v Tigers. 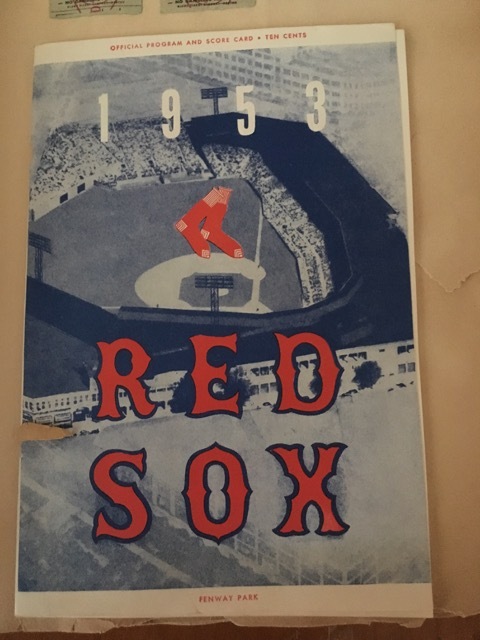 60c each for bleacher seats (he saved the stubs), and my father faithfully kept score in the program. Final score 8 – 5, Boston. My father always loved folk music. He told me once that he used to treat himself occasionally on payday to the newest Burl Ives record, purchasing it at a little record store somewhere near the hospital. We still have a lot of those records. 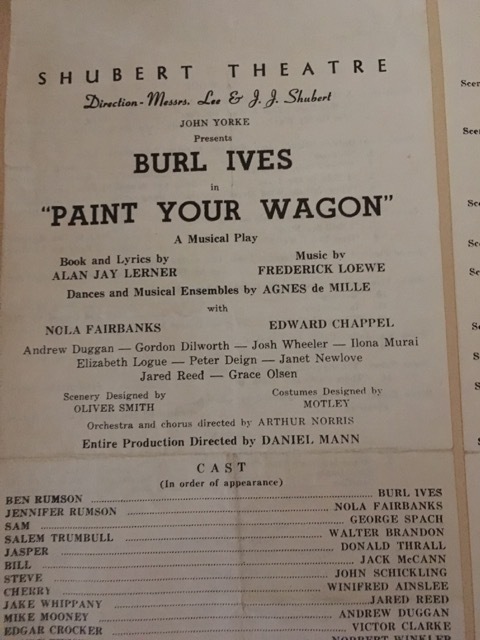 So I was delightfully surprised when I was looking through the scrapbook and saw that he and my mother had gone to see Paint Your Wagon at the Shubert Theater in Boston — starring none other that Burl Ives. I’ll bet he sang “Wandering’ Star” a lot better than Lee Marvin. I try to remember what Bud and I did for our first dates. We didn’t go to boxing matches or any other sporting events. We went for walks. We went to an auction. We went to church. We went to the movie “Coal Miner’s Daughter” and had to wait in line to get into the theater. We went to the drive-in and locked ourselves out of the car. But we didn’t keep a scrapbook to tell the story for future generations. I’m thankful my parents did. 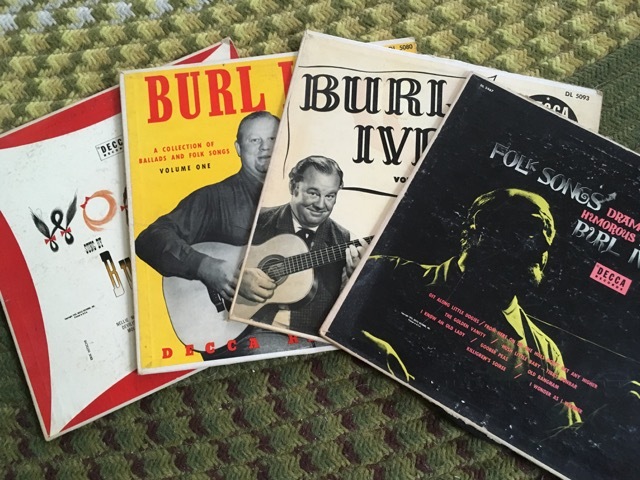 Burl Ives was a neighbor and friend of my husband’s great-uncle Bob. I loved some of the stories he shared. Thank you for this delightful look at your dad’s precious memories. That’s so cool! It’s almost like knowing Frosty the Snowman, or, at least, another talking snowman! My grandparents liked to watch professional wrestling. I don’t know if they ever saw it in person, but they were one of the first families to get a tv and my mother says professional wrestling was on tv a lot in the late 40s/early 50s. What great mementos from your parents’ marriage! 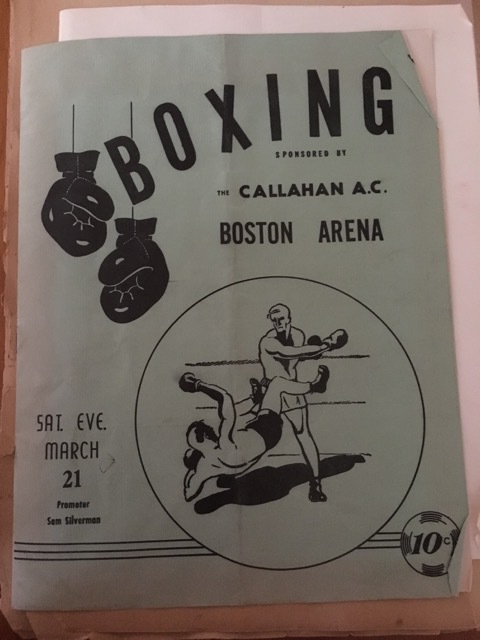 My father was a big fan of boxing as well, he followed all of the Irish boxers. I was happy to find a stash of my Mom’s records and enjoy playing them. That’s pretty cool that your dad kept a scrapbook of him and his honey’s dates. Seeing the hockey stub reminds me of a photoblogger I knew who passed away two or three years ago. 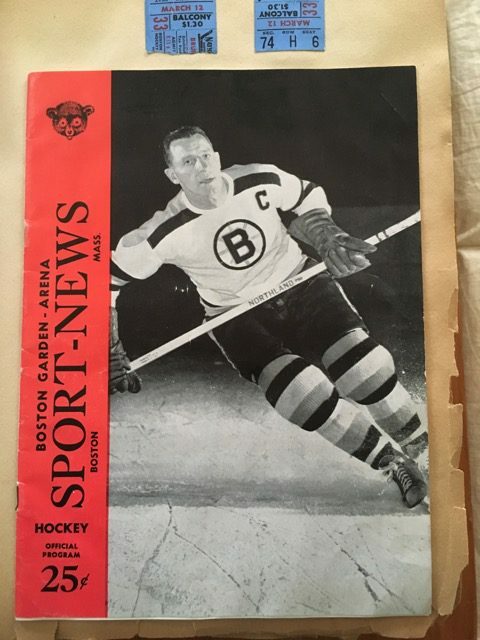 He was a die-hard Bruins fan, and mentioning the Montreal Canadiens could always get a comment out of him. The Bruins and Habs have had decades of mutual animosity. My mother used to watch boxing matches on tv every week. Strange when I remember it. She also listened to opera every Saturday. We had a record when we were very small of Burl Ives singing “The Moon is the North Winds Cookie” and it scared my younger sister, who was about 2 or 3.